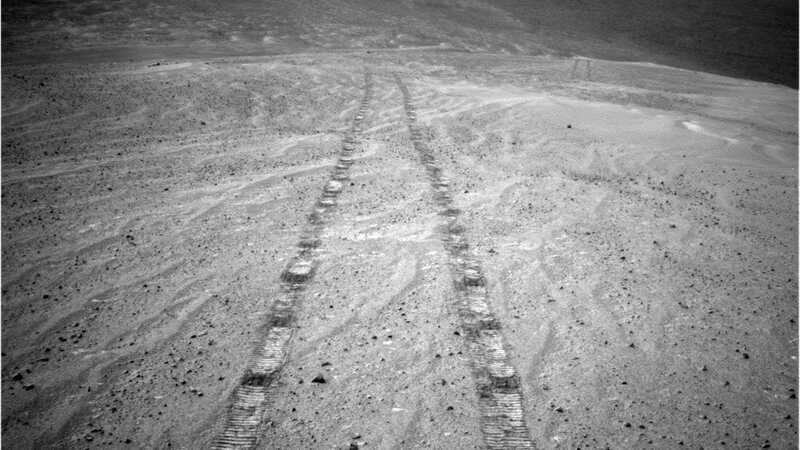 The tracks left on Mars via the Opportunity rover, photographed on November 12, 2013. A brutal dust storm exploded on Mars last summer. The skies throughout the planet survived the healing power of nuclear warheads, but the older, solar-powered Opportunity rover closed as the thick dust blocked Sunlight. The opportunity remained silent since June 10, 2018, despite hundreds of NASA's attempts to contact it. When a windbreak on Mars began in November, scientists expect the gusts to remove debris from its solar panel, but that hope is somewhat meaningless. NASA continues to send recovery orders, but sadly, it seems that the Mission Option has finally ended. At the same time, 2019 marks a historic milestone for the rover, who officially reached his 15th year on Mars on January 25. It exceeds the initial expected life of the rover for 90 days. Along with the Rover of the Spirit, whose end came in 2010, the mission of Mars Exploration Rover (MER) marks one of the most important scientific programs of the modern era, in search of evidence that Mars was once covered in liquid and sending iconic image over the planet. I have not given any more. We have a list of things to try, and we can not do until we try everything here. But we get under the list, so it's a good time to start thinking about these things. As you feel, it really feels good … It's a noble death. [The rovers] is not immortal. You know that you will lose them as soon as possible. To have a 90-day mission for 15 years, and then finish as a result of one of the most raging dust storms that hit Mars in a long time, we can walk away with our head high. The mission goes beyond what I can expect. The legacy is tough … The legacy is the legacy of both Sprit and Opportunity, and the spirit and the legacy of the team built upon them in the first place, the team of engineers, scientists, rulers, leaders, and financial person. The reason why this is a success is because they did 15 years ago. That's where credit is counted. In scientific heritage, Mars has become a much more interesting place than I expected. It has changed the way people see Mars. The three landings that were ahead of us were all on the flat, bare plots-for the purpose-because they were the safest places to land. That's all the land we saw. That is what motivates me about doing a mission. We have small beautiful rovers that climb the mountains and go down to the craters. Mars has become a truly beautiful, beautiful, interesting place in consciousness that you might think is present and walking on rovers tracks and see what they have seen. Our vision changes. The third part of legacy is the effect of these missions on children. One of my dreams, and I know this is likely to happen, was an 8 year old watching television in 2004 at night that we came and thought to themselves, "Whoa, I think that's cool, but I can do better. " I see the evidence that that mission has done at some level, astonishing young people to promote science, engineering, and technology races in their own dreams. Mosaic selfie shows dust-free solar panel Opportunity in December 2004. Everyone talks about amazing engineering that allows us to have a robot driving on another planet without a mechanic weird conditions within 15 years. That's a wonderful achievement. But for me and the people on the team, there are all 15 years. There are people on Earth in science and engineering teams that combine three to five times a week to meet progress from the day before, and carefully programming what Opportunity will do the next day. For that group, it's more than just a robot, and we'll miss it …. It's fun to work, it's fun to be successful. And that level of dust is certainly a respectable death if we can not hear from it again. I hope Opportunity is back in line! I'm in the back team at MER in graduate school (2003-2009), which is a testament to how long the mission-15 years is almost three consecutive Ph.D lengths! Opportunity makes good science until contact is lost, and discovering new rock units that should not be reached by its original design parameters. The same Spirit and Opportunity has completely changed the way we make science on Mars, and it is safe to say we can not have Curiosity without the sole success of the MER mission. The Spirit and Opportunity * figuratively * opens the way for Curiosity and future suffering throughout the Solar System, through their achievements of technical and scientific achievements. Opportunity captured images of Martian cloud passing overhead on October 2, 2006. Opportunity is beyond any expectations we may have for him. He unlocked the mystery of the signal hematite detected from orbiters before him, taught us about the same watery and windy past conditions on Mars, and caused far beyond any other rover across the Earth. Regardless of what the Red Planet looks like to him, he and his clever team of engineers have found a way around it-to this last dusty world. But just the thing that finally got Oppy out is the strongest dust storm we have observed on Mars. Now he can rest, knowing that he is humanity proud as our little robotic messenger. The Opportunity rover is a real inspiration for during the development of the Curiosity rover, as it shows how real Field geologists can jointly associate the story of an ancient atmosphere by studying the record held on rocks. The ancient water flowing over, the trees between the mountains of sand, the ground water scattering stones, like the beautiful things … all are keeping me in the most difficult time day of the Curiosity of Mars. Figures like this, by flowing fluid, scientists have provided clues to the wet season of Mars. Opportunity took on July 17, 2004.
the path for public communications about an active science mission when Steve Squyres and Jim Bell made the choice to make all the images available to the public when they came to Earth. They want to make sure students are able to work with data, and no need to be on some password-protected servers … Jim and Steve said, "No, we want the public to enjoy the adventure the same way we are. "That decision is brilliant. It created a large international community of people who were able to follow the daily dream of exploring another planet through the eyes of the Spirit and Opportunity. People make mosaics and animations, discuss the rocks they see, and what the science team does. On many occasions, people in Europe will see images before the American team-Squyres wake up like checking these forums because it's easier than dealing with [the server]. There is no copy of Cassini's team to share their photos in this way. NASA's Jet Propulsion Lab (JPL), which saw the mission of Mars Exploration Rover, is okay, we will also say Cassini's photos. Many other missions followed their footsteps-all of the missions that arrived on Mars, such as Curiosity, Phoenix, and InSight. This has been influenced by the European Space Agency to be more open to their image data-their structure is different than NASA's structure, as the institutions are building and providing cameras-but they have already started sharing a camera called VMC distributes images [from Mars] as soon as they hit the Earth, and Rosetta shared their NavCam images fairly quickly. Juno and New Horizons quickly share their data … There is a profound influence on the missions of the way that their data is shared with the public. I think it's interesting that when Opportunity starts silently, many people are ready to write it down immediately. That may be a more pragmatic thing to do, but it does not take into account the sense of the people who keep this spacecraft alive for so long. I think it is necessary for teams to deplete each possibility so they can feel some closure in the mission. Some of them are sure I do not want to give up … Need a big emotional investment to keep these missions. I think I'm hoping that Opportunity will surprise us and come back. I'm guessing it probably will not, and I'm sorry for engineers for their loss. I miss, first and foremost, just contacting the team on a regular basis. These people are working on this mission for a long time, and even when people leave and others come in, it has a really wonderful sense of friendship. I can all know by their voice. I know we can rely on people when we encounter challenges or difficult questions in science. It's really fun to work on all these problems with people involved. I'll also get hit every morning and see what rover sent, what's the latest photos. Every day you see something that no one ever saw. I have a very personal story on the rover. I am in high school when the Spirit and Opportunity comes. There was a program run by The Planetary Society called the Student Astronaut Program that brought high schoolers to JPL to be there at night the rover arrived. There I was at Opportunity that evening, and it was a wonderful experience that inspired me to enter planetary science. The way both Spirit and Opportunity transformed Mars science was pretty deep … It gave us a new perspective on the planet that we did in the year 2000. The rovers were sent to follow the water, and before we went there is no definite evidence that there was ever liquid water on Mars in the past. These are the first images from Oppy, and later images from the Spirit, which are unquestionably evidence that Mars has different climates that can support liquid water over. It opens a whole new space parameter for questions we can ask about the evolution of Martian. These questions are answered by Curyosity rover, a larger new rover with more sophisticated instruments, and some of them are answered by sample mission returns; Some require future missions to answer. We do not know what questions to ask before we get the results from Spirit and Opportunity. I'm glad that it takes as long as it does not. This is a celebration for how successful and groundbreaking this mission is. Opportunity of the shadow, November 26, 2014.